As we mature, grow and evolve, we go through discernible stages of understanding and development, which are physical, emotional, mental, social, and spiritual. 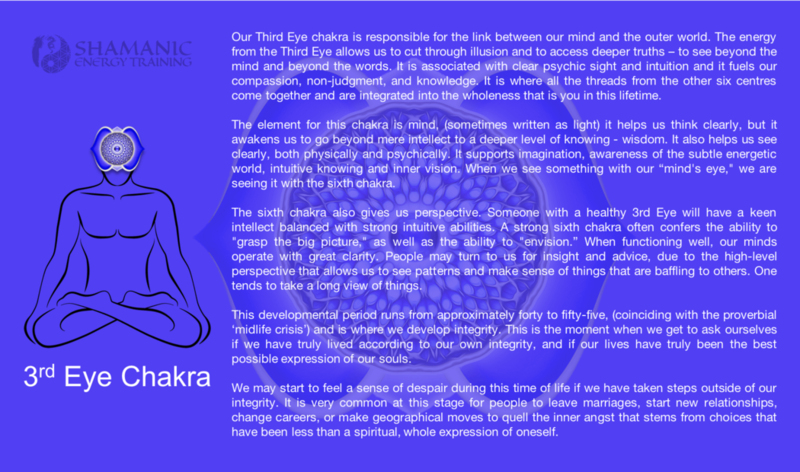 An in depth knowledge of our Chakras helps us understand the stages of our own spiritual growth. As we progress through our life cycle, we channel and unlock the energy, and level of awareness, held in each chakra, during each phase of development. However, if our environment is unsupportive, or if we suffer psychic or emotional trauma during any phase, we are sometimes prevented from achieving the milestones of that particular stage of development, and we can become less prepared for the next developmental challenge. Our soul, the essence of our nature, transcends time and space. Everyone has this eternal life force within them. When you acknowledge that you are the essence of eternal life, you will experience a sense of freedom and connection. Each of us has all of our life lessons and developmental stages within us, simultaneously making demands and providing perspective, insight, and wisdom. These are all stored in our Chakras and energy system. Imbalances in our energy centres tend to manifest as unhealthy behaviours, character traits or disease. 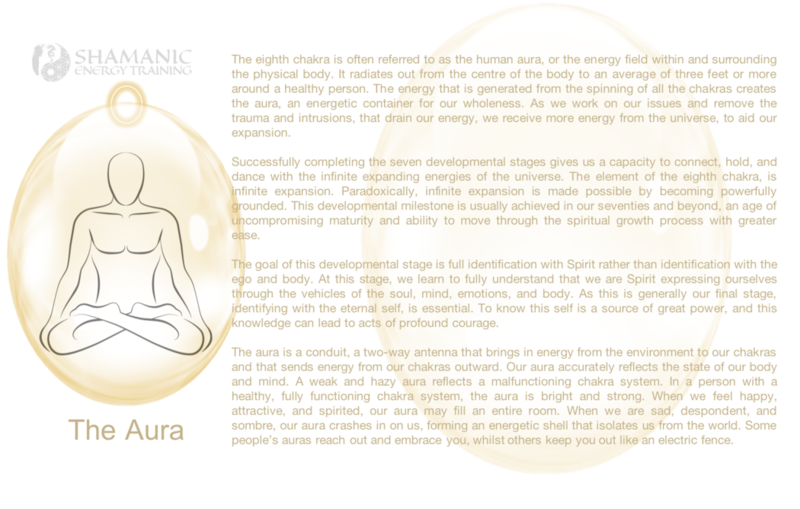 Any limitation or challenge that you experience in life can also be recognised as an imbalance in the associated chakra. This series will include shamanic journeys, guided meditation, physical exercises, reflections, ceremony, breath work and direct chakra work, to help you unblock and activate your Chakras. As we grow we experience distinct stages of development which correspond to our chronological age, and the capacity of our nervous systems to process events, information, relationships, complexity and trauma. As we mature, our capacity to process these experiences, improves. Although, we are not always able to process all of our experiences. Some may overwhelm us, or leave us feeling unready or ill prepared, and we may feel their negative impact for some time. Energetically we hold on to every experience we have ever had; and it’s impact on our nervous systems and our emotions; until such times as we seek out to heal from them. After years of practice and study, we now believe that a person is a collection of all their experiences. We seem to have children and adults of many ages inside of us; and these ages organise themselves loosely around eight energy centres, and their developmental stages. The Southside Venue is Healing Delight, Unit 6, 219 Balaclava Rd, Caulfield North VIC 3161 Classes are held on Monday for 6 weeks, starting 11th November at 6:30pm. The Northside Venue is Ashtanga Yoga Centre of Melbourne, 112/110 Argyle St, Fitzroy VIC 3065. Classes are held on Thursday for 6 weeks, starting 14th November 2019 at 6:30pm. To reserve your place, you will need to fill out this form and pay a $50 deposit. The full price is $300. First Class is 2.5 hours, Last Class is 3.5 hours - all classes in between are 90 mins. The Series is supported by a private Facebook Group. Chakra exercises facilitate the flow of energy throughout the body by stimulating each chakra and associated energy channels. You will be participating in exercises to help you locate, consciously feel, and awaken the individual chakras. Throughout the 5 weeks we will be developing our sensitivity to our energy centres‍‍ and learning to cleanse and activate our chakras. There will also be optional homework to continue the work at your own pace. With practice, energy training participants learn how to feel their own energy bodies and hold their own energetic space, which eventually helps them to ground their energy. With a developed energy body, you can begin to develop a "truth core", which let's you derive the most accurate information from your own intuition. With time, you will begin to understand the difference between your energy influences and those of others, so you can know what is your stuff (energetically) and what is someone else's influence over you. The foundation is required to build stability. If you are a Healer, Practitioner, Energy Worker or hold events and workshops for large groups of people, then you will also benefit from learning energy techniques to ensure that you can hold powerful clean energetic spaces in your own clinics and client interactions. A greater sense of meaning and purpose in life. RELAXATION: Full guided relaxation to assist the physical body to receive the benefits of the class. Guided meditations and visualisations to help you release old emotions as well as sense and activate Chakras. BODY TAPPING: to open up the meridian system. Tapping encourages energy flow and detoxification. Every human has a divine essence, a soul, and our bodies act as temporary housing whilst we undertake this human journey. We came to the Earth in order to learn, grow and evolve. All of the lessons and tools we need to complete our soul’s journey are already contained within our bodies. The apparent difficulties and experiences that come with a human body, create the learning environment that enables our soul's wisdom to expand. The chakras are vitally important to the growth of the soul, as they contain the energetic mechanisms that enable us to reconnect to our divine nature. Learning to understand our life energy as contained in our energy fields and chakras, helps us complete our soul's Journey. 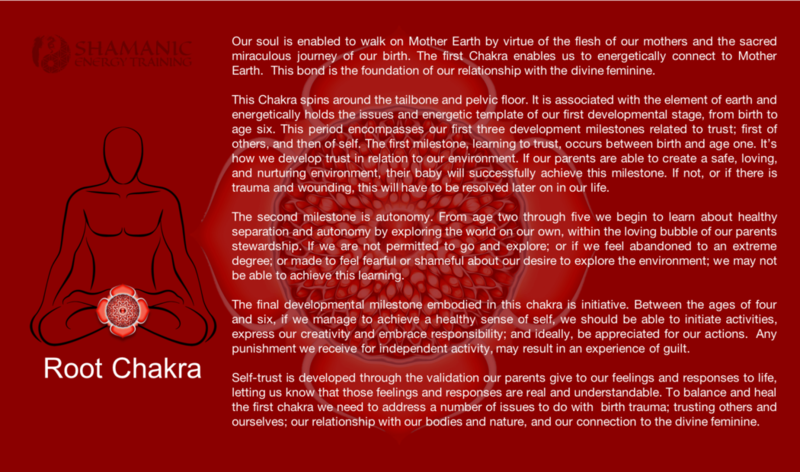 The chakras interface with the body primarily through our endocrine glands and spine. They act as an interface between our personal energy and the universal energy field. Energy flows in and out of our bodies in a never-ending exchange with the universal energy field. Each of the seven major chakras acts as a conduit for a particular form of energy, assimilating and distributing it to specific physical, mental, emotional and spiritual functions. You can think of the Chakras as the ‘organs’ of your body's energy system and every aspect of health is connected to one or more chakra. We can learn a lot about ourselves by exploring our chakras, and can improve our life and health. Develop a connection to something greater, find meaning, experience more wonder, and feel more inner peace. 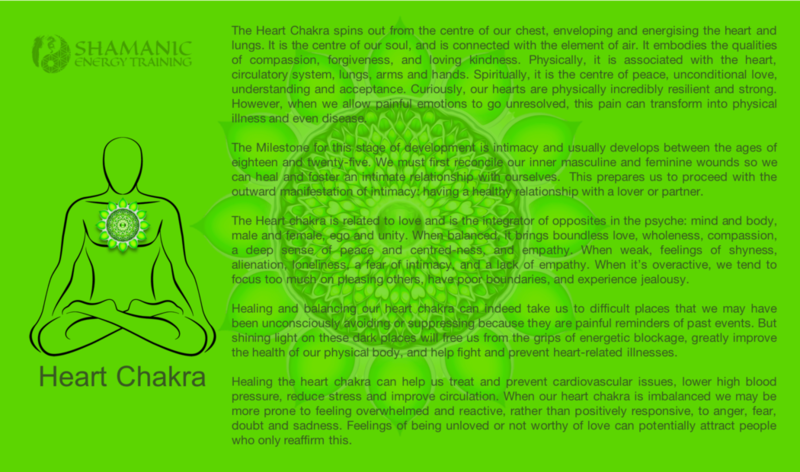 When we experience ill health, it may be due to an imbalance or energy blockage in the associated chakra. When an energy blockage occurs, life force energy, or Qi, cannot flow freely and may affect our physical, mental, emotional and spiritual health. Chakra imbalances may be caused by stress, poor nutrition, lack of exercise, cultural conditioning, physical and emotional injuries, or a disconnection from a higher truth, among other reasons. As energy flows through the top of the head and down to the chakras, each chakra nurtures a distinct form of energy related to specific aspects of physical and spiritual development. 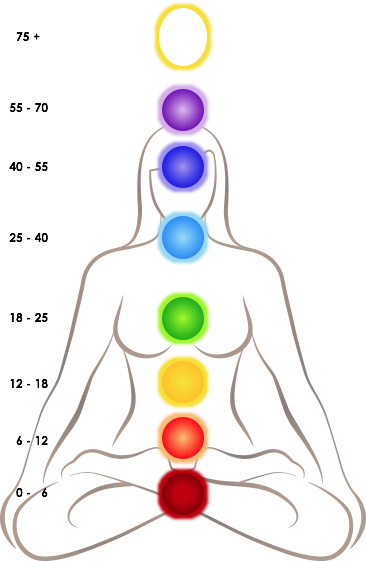 Energy in turn flows upwards through the chakras, resulting in universal interconnectedness. Chakra imbalances, or stagnated energy associated with a specific chakra, affect the energy flow along the nadis and meridians. Each chakra supplies energy to specific organs, and corresponds to universal principles of our personality: survival, creativity, identity, love, expression, comprehension, and transcendence. Our chakras also code (or record) our experiences in their energies, just as memories are chemically coded in our neurones. An imprint of every emotionally significant event you have experienced is believed to be recorded in your chakra energies. 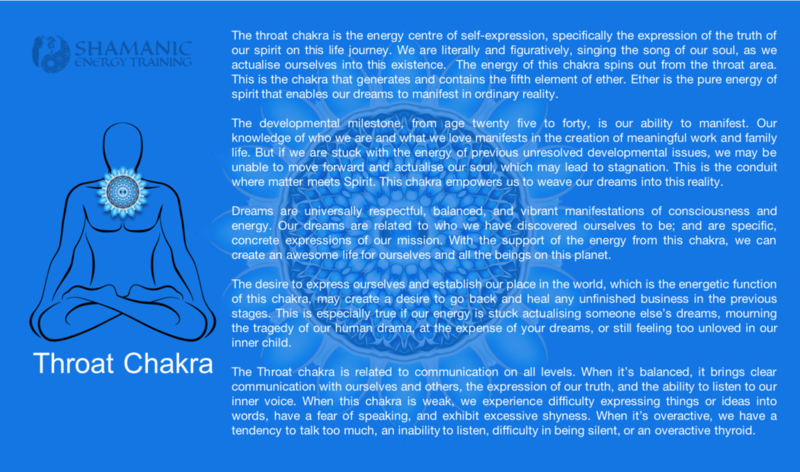 Negative thoughts and emotions can block or distort the flow of energy in a chakra. Long periods of overwork can deplete a chakra. Overemphasis on a particular aspect of life (such as becoming too focussed on the ’material’ world) can result in an imbalance. Emotional trauma can cause a variety of disturbances. A person’s upbringing, environment or culture can lead to imbalances. We can be born with a particular chakra imbalance, with part of our life’s work being to restore it to harmony. 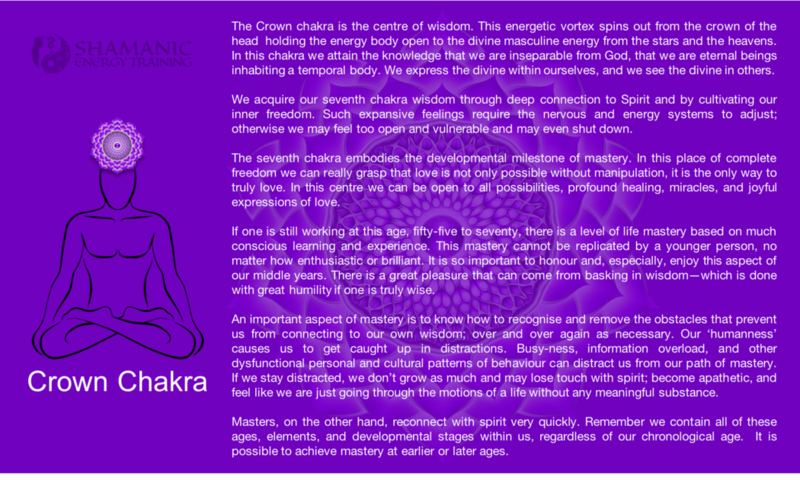 Development in one chakra can create a need for readjustment in other chakras. A new insight, readiness for personal growth or life development (e.g. marriage, parenthood or old age) can cause a particular chakra to need to open more in response and thus throw out the other chakras.